I recently added a new type of post to my blog: character types! So far, it seems to be a success. Last month, I wrote about The Best-Friend-Turned-Evil-Villain (aka. BFTEV). Another one of my favorite character types is the Pessimistic Mentor. You know the one. They’re typically condescending and will point out every single way the heroes fail. Some examples of the Pessimistic Mentor include Puddleglum (The Silver Chair), Hamish (The Hunger Games), Han Solo (The Force Awakens), and Hub (Secondhand Lions). But there’s more to the Pessimistic Mentors than just being down all the time. In fact, they tend to have some admirable qualities. They tell things the way they are. If they think the protagonist is going to die or at the very least be mortally wounded, they’ll tell the protagonist. After all, what else would they do? No sugarcoating involved here. Pessimistic Mentors tend to be honest. Because they tend to be so blunt about the truth, it means more. If they tell the protagonist there’s a 99% chance of death, the protagonist will take EXTRA caution (hopefully). If they praise the protagonist for something, it may come as a surprise, but it means so, so much. Of course, there are exceptions. Hamish isn’t exactly honest. Not if you consider he lied to Katniss for basically the whole of Catching Fire. They’re stubborn as a rock. Chances are, if a character ever lives long enough to be a mentor, he or she is probably going to be set in his or her beliefs. This character is no exception. When it comes to cheering them up, forget it. But they tend to teach the protagonist from lessons they learned themselves. Walter helped teach his great-uncles that there’s more to life than just hording wealth. Sometimes you have to experience life. Not that it got rid of Hub’s crazy nature. Pessimistic Mentors tend to have interesting backstories. Which may be why they’re so stubborn. 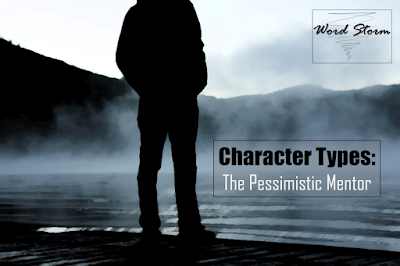 Although the Pessimistic Mentor may not develop much as a character in the current narrative, he or she might have already done so in the past. Yet even for the stubborn one’s, there’s room for growth. Sometimes the protagonist may surprise them. They’re loyal to a point. Even though they know the situation may be helpless, they will stand with the protagonist to the end. Hamish advised Katniss when he had to as her mentor, then stood up with her against the capital as her friend. Hub and his brother Garth took their great-nephew under their wing when his own mother didn’t want him. Han Solo still loved his son despite everything that happened. They get some of the best lines. Whether it’s a funny or serious, mentors tend to get some of the most memorable lines. In The Force Awakens, Han Solo knows a lot more about the Force than he used to. There are so many more lines I could reference, but I won’t here for the sake of conserving space. Sure, the Pessimistic Mentor can be as annoying as an alarm clock, but at least they’re consistent. They may be as touchy-feely as a cactus, but at least you know where they stand. Literary references: C. S. Lewis’ The Silver Chair and Suzanne Collin’s The Hunger Games trilogy. Who is your favorite Pessimistic Mentor? What’s your favorite quality or line by him or her? What type of fictional character do you want to read about next—That Guy Who Just Won’t Die, The Humble Heroes, or somebody else?